Photo Credit: Kathryn Hull via Sally Stackhouse. The holiday cottage looked so good in the brochure. Daphne scrolled down and looked at a few more listings but still came back to the property she had first clicked on. Frank sat down beside her scanning the details of the property, winked at her in his special way and before she knew what had happened he was merrily clicking away on the computer. Two weeks overlooking the seaside down on the South-East coast was booked in an instant. A holiday by the sea would sweep away all the cobwebs. Time to take stock and renew their energy levels. This past year had been quite traumatic in many ways. The thought of leaving their well-ordered life and having leisure time now they were both retired was quite daunting. They talked about what they could do coming to the consensus that they would turn over a new leaf and make plans for their future together. No more watching the clock. No more alarms ringing loudly in the early hours of the morning. No more rushing around trying to fit everything in. They could do anything they wanted on any day of the week. Daphne and Frank entered through the door to their home for the next fortnight. Her spirits lifted. She could feel blockages in her mind stretching out and disappearing, smoothing the stress out and releasing her. She let out a freeing breath. Free to enjoy the sights. Free to enjoy the coast. The next day Frank came back in from his morning walk. This was his regime now, he would walk to a shop, buy a newspaper and return to read it at his leisure with a cup of tea. Discussing what to do with their day they watched the storm clouds rolling in over the cliffs. 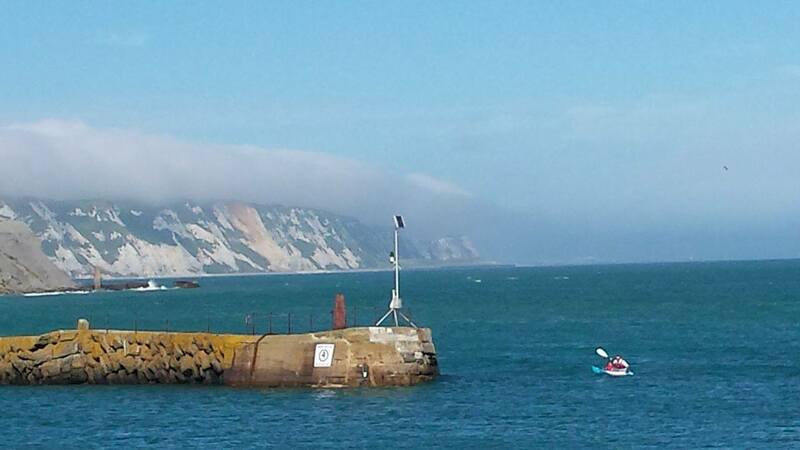 That bank of clouds over the cliffs looked quite ominous. The sound of the seagulls squawking as they whirled above the sea was eerily comforting as they relaxed on the balcony. Frank pointed out a kayak in the sea. They watched the pair of rowers trying to control the small vessel on the water that seemed to become choppier as they tried rounding the sea wall of the port. Frank agreed with Daphne as he stopped reading and watched them struggle. As the weather was turning the couple decided to visit an antiques market held in the old part of the town. There was so much to look at that they went their separate ways meeting up for tea and cake at the little cafe across the road. Daphne’s curiosity got the better of her as she spied a package in her husband’s hands. Frank gave her his special wink again as he showed her the vintage chisel set encased in a wooden box. She felt no guilt about her purchases. I kept waiting for the "chisel" to appear. It did not disappoint! A delightful read of their special holiday.